Introducción. El desarrollo motor es la adquisición y evolución de habilidades motoras; su valoración permite detectar alteraciones y promueve una atención oportuna y adecuada. Se han diseñado varios instrumentos para valorar el desarrollo motor en la niñez temprana, entre los que se encuentra el test Neurosensory Motor Development Assessment. En Colombia no hay estudios publicados sobre las propiedades psicométricas de cualquiera de estas pruebas y la vigilancia del desarrollo motor se realiza con la Escala Abreviada del Desarrollo, de la cual no existen reportes de validez o reproducibilidad. Objetivo. Evaluar la reproducibilidad del componente motor de la Escala Abreviada del Desarrollo y de una traducción al español del instrumento Neurosensory Motor Development Assessment, así como la validez convergente entre las dos pruebas. Materiales y métodos. Se realizó un estudio de evaluación de tecnologías diagnósticas. La población estuvo conformada por 260 niños de 4 y 5 años de edad. Para el análisis se aplicaron coeficientes de correlación intraclase y los límites de acuerdo de Bland y Altman, así como el coeficiente de correlación de Spearman (r). Resultados. El coeficiente de correlación intraclase y el promedio de las diferencias para el Neurosensory Motor Development Assessment, fueron 0,91 y 1,23, y para la Escala Abreviada del Desarrollo, 0,96 y 0,02, respectivamente. La validez convergente mostró un r de 0,51. Conclusiones. Los dos instrumentos tienen buena reproducibilidad entre evaluadores. La convergencia entre las pruebas es moderada y posiblemente se explica por las diferencias en el enfoque de medición de cada instrumento. 1. American Physical Therapy Association. What types of tests and measures do physical therapist use? (A guide to physical therapist practice). Phys Ther. 2001; 81:51-103. 2. American Academy of Pediatrics. Developmental surveillance and screening of infants and young children. Committee on children with disabilities. Pediatrics. 2001;108:192-5. 3. Goyen TA, Liu K. Longitudinal motor development of «apparently normal» high-risk infants at 18 months, 3 and 5 years. Early Hum Dev. 2002;70:103-15. 4. Kroes M. Early motor, psychosocial and behavioural characteristics of attention-deficit/hyperactivity disorder (thesis). Maastricht: Maastricht University; 2000. 5. Sullivan MC, McGraft MM. Perinatal morbidity, mild motor delay and later school outcomes. Dev Med Child Neurol. 2003;45:104-12. 6. Merrell KW, Holland ML. Social-emotional behavior of preschool-age children with and without developmental delays. Res Dev Disabil. 1997;18:393-405. 7. Kroes M, Kessels AG, Kalff AC, Feron FJ, Vissers YL, Jolles J, et al. Quality of movement as predictor of ADHD: results from a prospective population study in 5-and 6-year- old children. Dev Med Child Neurol. 2002;44:753-60. 8. Largo RH, Fischer JE, Rousson V. Neuromotor development from kindergarten age to adolescence: developmental course and variability. Swiss Med Wkly. 2003;133:193-9. 9. Piper MC, Darrah J. Motor assessment of the developing infant. Philadelphia: W.B. Saunders Company; 1994. 10. Brenneman SK. Assessment and testing of infant and child development. En: Tecklin JS, editor. Pediatric physical therapy. 3ª edition. Philadelphia: Lippincott Williams & Wilkins; 1999. p. 28-70. 11. Boulton JE, Kirsch SE, Chipman M, Etele E, White AN, Pape KE. Reliability of the Peabody Developmental Gross Motor Scale in children with cerebral palsy. Phys Occup Ther Pediatr. 1995;15:35-51. 12. Schmidth LS, Westcott Sl, Crowe TK. Interrater reliability of the gross motor scale of the Peabody Developmental Motor Scales with 4- and 5- year-old children. Pediatr Phys Ther. 1993;5:169-75. 13. Wiart L, Darrah J. Review of four tests of gross motor development. Dev Med Child Neurol. 2001;43:279-85. 14. Flegel J, Kolobe T. Predictive validity of the test of infant motor performance as measured by the Bruininsks-Oseretsky test of motor proficiency at school age. Phys Ther. 2002;82:762-71. 15. Crawford SG, Wilson BN, Dewey D. Identifying developmental coordination disorder: Consistency between tests. Phys Occup Ther Pediatr. 2001;20:29- 50. 16. Frankenburg WK. Developmental surveillance and screening of infants and young children. Pediatrics. 2002;109;144-5. 17. Stengel TJ. Assessing motor development in children. En: Campbell SK, editor. Pediatric neurologic physical therapy. Second edition. Illinois: Churchill Livingstone; 1993. p. 33-65. 18. Rodger S, Ziviani J, Watter P, Ozanne A, Woodyatt G, Sprinfield E. Motor and functional skills of children with developmental coordination disorder: A pilot investigation of measurement issues. Hum Mov Sci. 2003;22:461-78. 19. Kroes M, Vissers YL, Sleijpen FA, Feron FJ, Kessels AG, Bakker E, et al. Reliability and validity of a qualitative and quantitative motor test for 5 to 6 year old children. Eur J Paediatr Neurol. 2004;8:135-43. 20. Provost B, Crowe T, McClain C. Concurrent validity of the Bayley Scales of Infant Development II Motor Scale and the Peabody Developmental Motor Scales in two-year-old children. Phys Occup Ther Pediatr. 2000; 20:5-18. 21. Burns YR. Physiotherapy assessment for infants and young children. Brisbane: Publishing Company Pty Ltd; 1991. 22. Burns YR, Ensbey RM, Norrie MA. The Neurosensory Motor Development Assessment. Part 1: Development and administration of the test. Aust J Physiother. 1989; 35:141-9. 23. Burns YR, Ensbey RM, Norrie MA. The Neurosensory Motor Development Assessment. Part 2: Predictive and concurrent validity. Aust J Physiother. 1989;35:151-7. 24. Burns YR, O’Callaghan M, Tudehope DI. Early identification of cerebral palsy in high risk infants. Aust Paediatr J. 1989;25:215-9. 25. Burns YR, Mohay H, Croker A. The predictive value of developmental testing of children under the age of 2 years. Physiother Theory Pract. 1987;3:2-10. 27. Burns YR, Ensbey R, O’Callaghan. Motor abilities at eight to ten years of children born weighing less than 1,000 gr. Physiotherapy. 1999;85:360-9. 28. Gray PH, O’Callaghan J, Mohay HA, Burns YR, King JF. Maternal hypertension and neurodevelopmental outcome in very preterm infants. Arch Dis Child Fetal Neonatal Ed. 1998;79:F88-93. 29. Burns Y, O’Callaghan M, McDowell B, Rogers Y. Movement and motor development in ELBW infants at 1 year is related to cognitive and motor abilities at 4 years. Early Hum Dev. 2004;80:19-29. 30. Ministerio de Salud. Resolución 412 de 2000. Santa Fe de Bogotá: Ministerio de Salud; 2000. 31. Grupo Interinstitucional de Programas de Salud del Niño en Antioquia. Salud Integral para la Infancia (SIPI). Crecimiento y desarrollo por grupos de edad. Tomo II. Medellín: Servicio Seccional de Salud de Antioquia; 1996. 32. Staquet M, Hays R, Fayer P. Assessing reliability and validity of measurement in clinical trials. En: Quality of life assessment in clinical trials. Methods and practice. New York: Oxford University Press; 1998. p. 171-5. 33. Kraemer HC. Evaluating medical test. California: Sage Publications; 1992. 34. Kraemer HC, Thieman S, Denenberg VH. Correlation coefficients. En: How many subjects? Statistical power analysis in research. London: Sage Publications; 1987. 35. Norman GR, Streiner DL. Bioestadística. Madrid: Mosby/Doyma Libros; 1996. p. 14-22. 36. Bland JM, Altman DG. Statistical methods for assessing agreement between two methods of clinical measurement. Lancet. 1986;1:307-10. 37. Lin L I-K. A concordance correlation coefficient to evaluate reproducibility. Biometrics. 1989;45:255-68. 38. Kraemer HC, Bloch D. Kappa coefficients in epidemiology an appraisal of a reappraisal. J Clin Epidemiol. 1998;41:959-68. 39. Kraemer HC, Periyakoil V, Noda A. Kappa coefficients in medical research. Stat Med. 2002;21: 2109-29. 40. Domholdt E. Rehabilitation research. Principles and applications. 3rd edition. St. Louis, Mo: Elsevier Saunders; 2005. p. 245-64. 41. Dean AG, Dean JA, Coulumbier D, Brendel KA, Smith DC, Burton AH, et al. 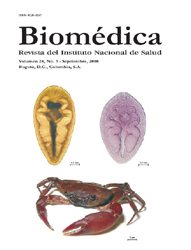 Epi Info, Versión 6.01: a word processing, database, and statistics program for epidemiology on microcomputers. Atlanta: Centers for Disease Control and Prevention; 1995. 42. StataCorp. Stata Statistical Software. Release 9.0. College Station, TX: StataCorp LP; 2005. 43. Coughlin SS, Beauchamp TL. Ethics and epidemiology. New York: Oxford University Press; 1996. 44. Bland M, Altman D. Measuring agreement in method comparison studies. Stat Methods Med Res. 1999;8: 135-60. 45. Latour J, Abraira V, Cabello JB, López J. Métodos de investigación en cardiología clínica. Rev Esp Cardiol. 1997;50:117-28. 46. Bruns DE. The STARD initiative and the reporting of studies of diagnostic accuracy. Clin Chem. 2003;49:18-20. 47. Campbell SK. Measurement in developmental therapy: past, present and future. En: Miller LJ, editor. Developing norm-referenced standardized tests. New York: Haworth Press; 1989. 48. Shumway-Cook A, Woollacott MH. Motor control. Theory and practical applications. 2nd. edition. Baltimore: Lippincott Williams & Wilkins; 2001. p. 1-25. 49. Koseck K. Review and evaluation of psychometric properties of Revised Bayley Scales of Infant Development. Pediatr Phys Ther. 1999;11:198-204. 50. Keating J, Matyas T. Unreliable inferences from reliable measurements. Aust J Physiother. 1998;44:5-10. 51. Guyatt G, Walter S, Norman G. Measurement change over time: Assessing the usefulness of evaluates instruments. J Chronic Dis. 1987;40:171-8. 52. Patton N, Aslam T, Murray G. Strategies to assess reliability in ophthalmology. Eye. 2006;20:749-54. 53. Hays RD, Anderson RT, Revicki D. Assessing reliability and validity of measurement in clinical trials. En: Staquet M, Hays R, Fayer P, editores. Quality of life assessment in clinical trials. Methods and practice. New York: Oxford University Press; 1998. p. 171-5. 54. Provost B, Heimerl S, McClain C, Kim N-H, López BR, Kodituwakku P. Concurrent validity of the Bayley Scales of Infant Development II Motor Scale and the Peabody Developmental Motor Scales-2 in Children with Developmental Delays. Pediatr Phys Ther. 2004;1 6:149-56. 56. Hadders-Algra M. The Neuronal Group Selection Theory: a framework to explain variation in normal development. Dev Med Child Neurol. 2000;42:566-72. 57. Hadders-Algra M. Variability in the infant motor behavior: A hallmark of the healthy nervous system. Infant Behav Dev. 2002;25:433-51.